This was an interesting model. I’ve used the same painting process I’m using on the rest of my Plague Marine squad from the Dark Imperium box, and the same I used on the Noxious Blightbringer. 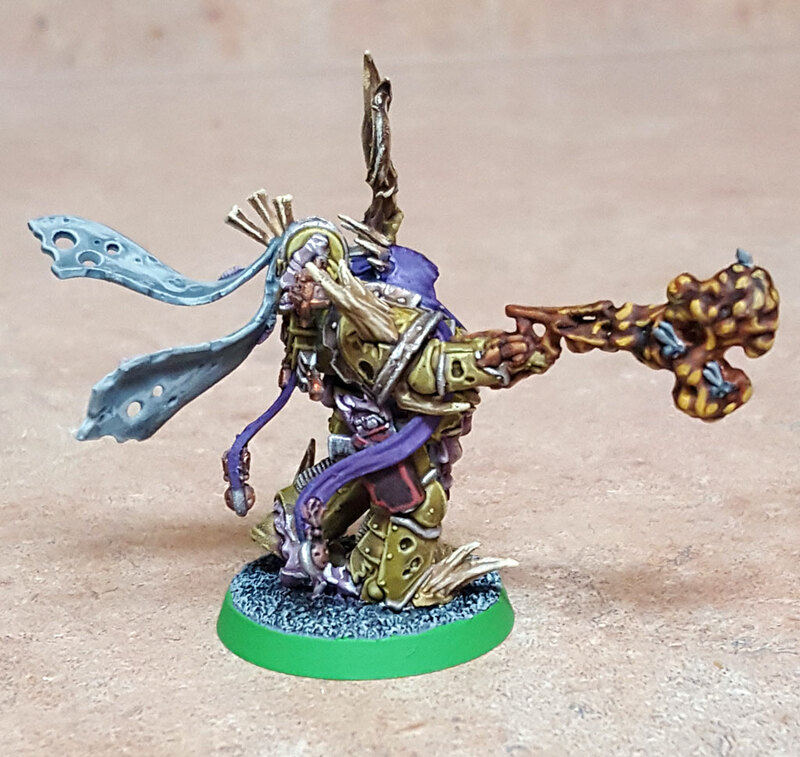 The one different here from the Blightbringer is that I used purple for the robes – in this case: Naggaroth Night, shaded with Druchii Violet, then layered with Xereus Purple. I’d have done a final layer of Genestealer Purple, but none of the local shops had it in stock. For whatever reason, primer seems to bond better with plastic than metal. That means both better adherence to the model and smoother, cleaner surfaces to paint. Also, the small details on the old metal models are just not that well done. Recesses in the new plastics are much deeper. That means the shades really help details pop on the newer models. On the metal ones, you still have to kinda “brute force” the highlights. It’s tedious and often frustrating. This Helbrute is, of course, from the old Dark Vengeance set. 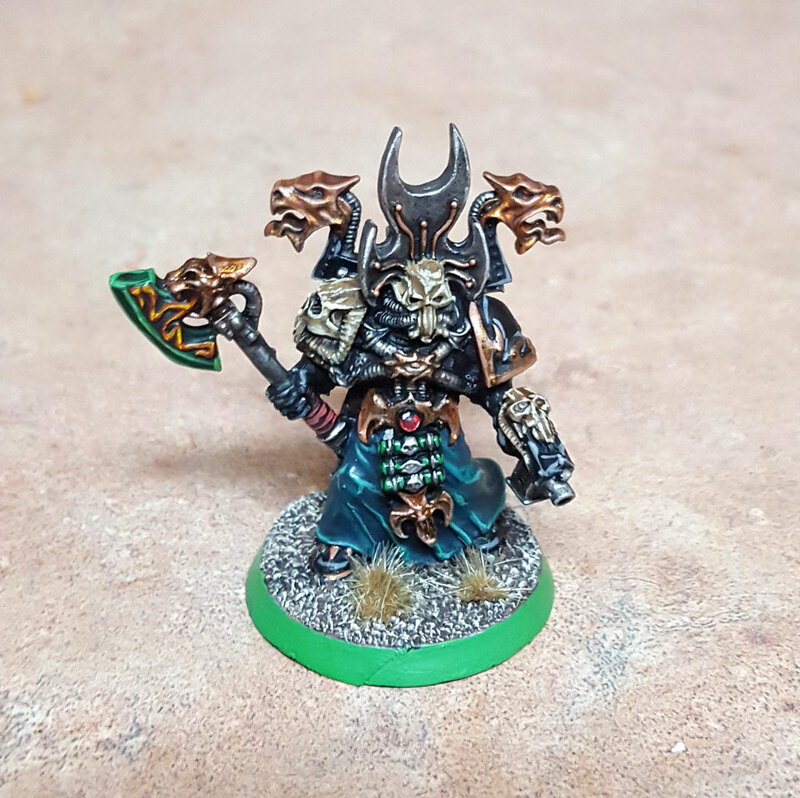 I decided to paint him up in World Eater colors, so I can add to that army. 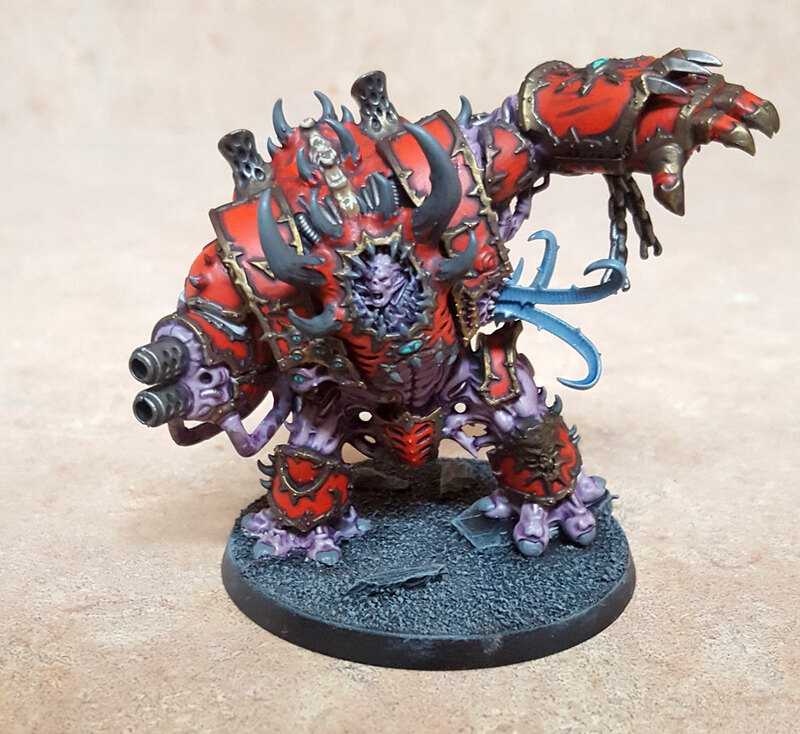 I mean, shouldn’t every proper World Eaters army have at least one Helbrute? Only seems natural to me. Anyway, I’ve got to give it to the “base coat, then shade” method Duncan uses on Warhammer TV. It gets models done fast, and they actually look fairly good. Really, the shades are the key. 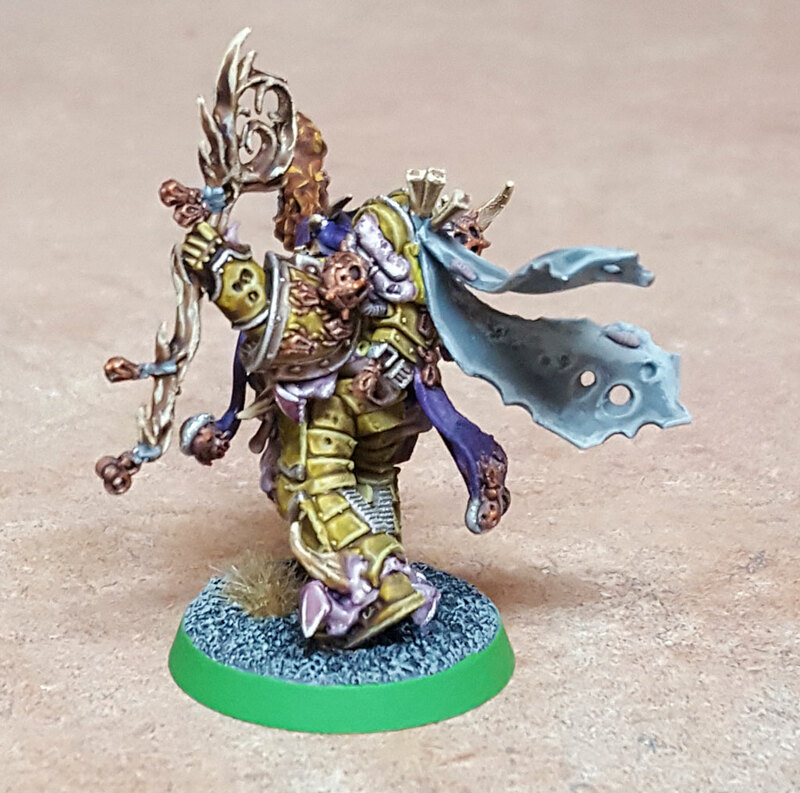 Of all the moves GW has made with their paints range, the addition of the shades is a huge, huge benefit. You don’t have to really dilute them (unlike the old inks) and they really do flow into recesses well. So I’ve been involved much less than I’d like in the Konor campaign. I’ve been enjoying it, even though the result might be a foregone conclusion. Games Workshop has done an excellent job on the campaign website and I’m fortunate enough to live near a couple stores that have player bases that are actively engaged in the campaign. But the Konor campaign isn’t really the point of this post. I realized that I hadn’t posted an update on my Foetid Bloat-drone in my past couple of entries, and I have updates on other models. Well, here goes. I’m pretty pleased with how the Foetid Bloat-drone came out. 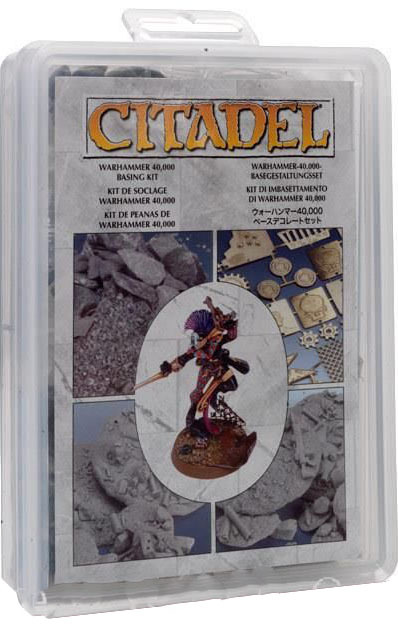 I’m glad I still had some stuff left from my Citadel Warhammer 40,000 basing materials kit. Sadly, those are out of print. But the stuff I scrounged from it makes the base look good. I couldn’t resist painting the damaged Space Marine helmet in Ultramarine colors. 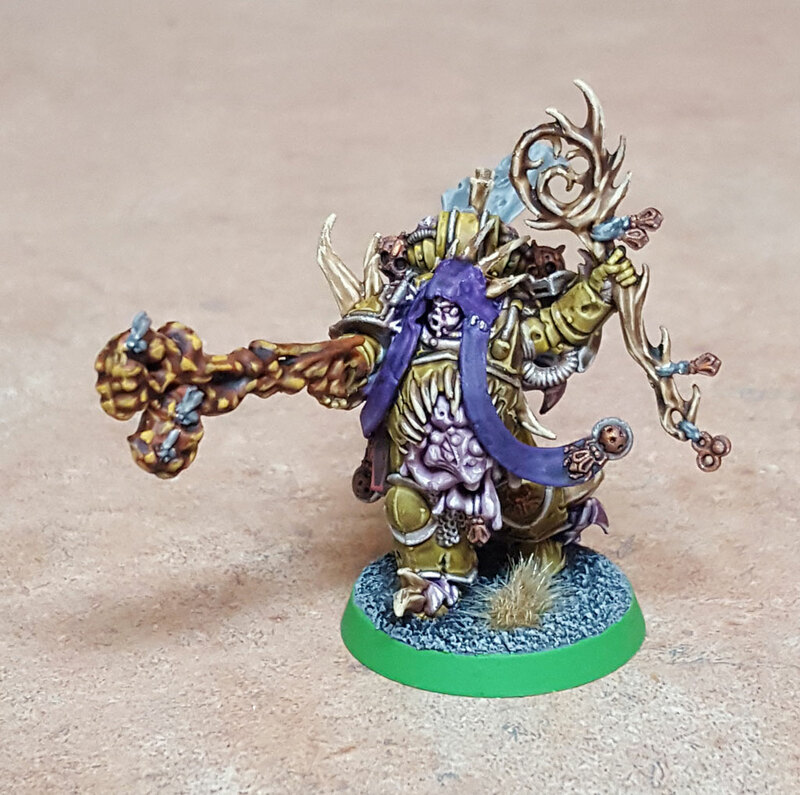 For the Bloat-drone itself, I followed the basic recipe you get from Duncan on Warhammer TV for the Lord of Contagion. I’m liking how the Rakarth Flesh -> Druchii Violet -> Pallid Wych Flesh comes out. I’ll certainly use that series on the rest of my Death Guard models for flesh and tentacles. I also like how the optical sensor came out and glad I left that until last. Another week of the Fate of Konor campaign draws to a close. 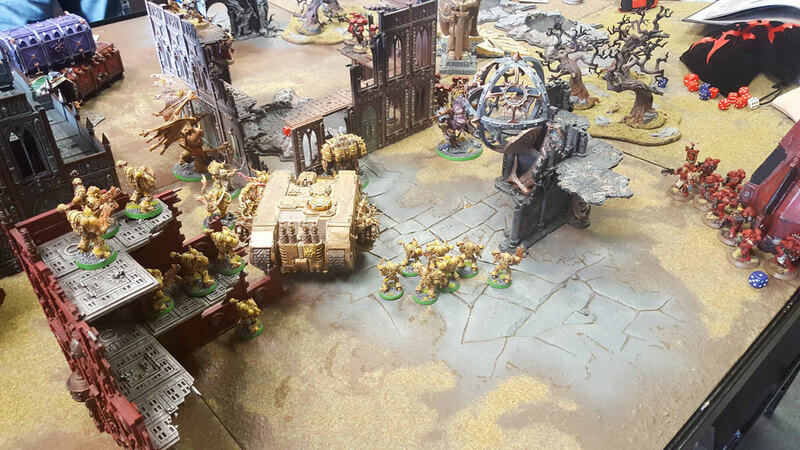 I had another battle on Friday, this time against Blood Angels. The Games Workshop store where we played was suggesting a 35 Power Level game, but since my opponent and I had much more than that, we played a game around 100 Power Levels. I ran my Death Guard and my opponent brought his Blood Angels. This was my first time playing against Blood Angels in the new edition of Warhammer 40,000. I wasn’t quite sure what to expect. I knew my opponent had several drop pods, and since scatter is no longer a part of the game, I wondered what kind of threat that would be for my force.